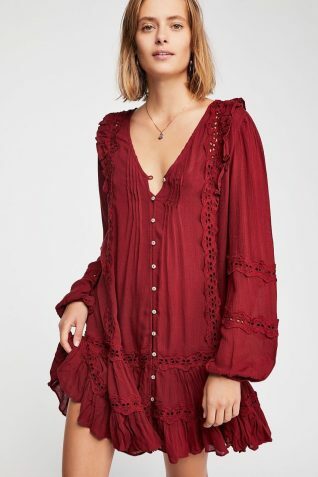 Free People Dress “Snow Angel Mini” – a very pretty short shapeless burgundy dress featuring eyelet design, V-neck, pintuck detailing, long sleeves, in boho chic style! Light weight fabric, removable underneath slip (with adjustable straps), easy comfortable fit. 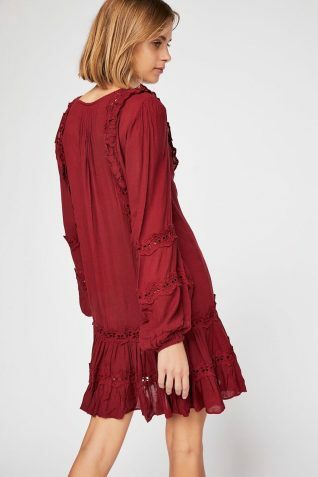 Gorgeous dress, indeed! Fitting Tip: purchase a size down, if you prefer a tighter fit.